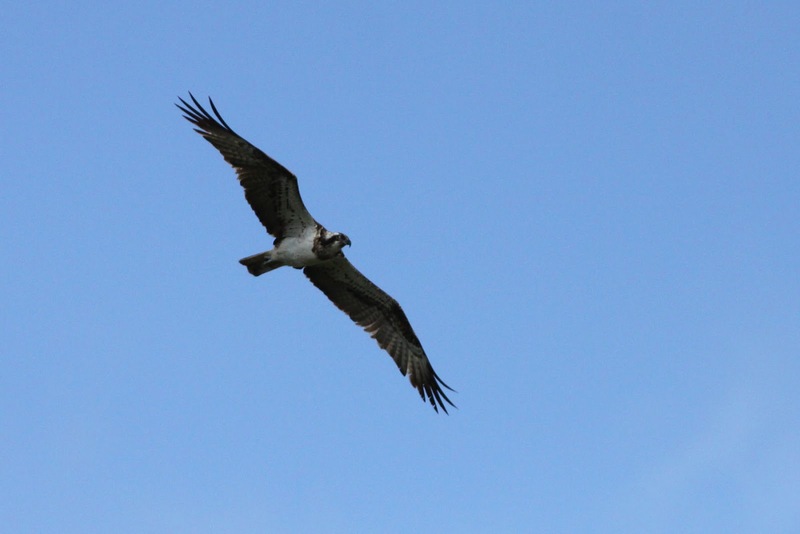 This morning has seen the third consecutive day of Osprey sightings, but the previous two day's birds have both been seen heading out to sea from North Light. The 15th saw a slight increase in migrant numbers and a pleasing roll-call of lingering birds. 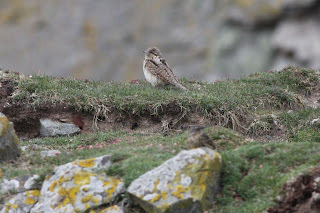 New birds included Icterine Warbler, Hawfinch, Wood Warbler, Yellowhammer and Pomarine Skua (from the Good Shepherd), whilst an Osprey was presumably also new, the previous day's bird having been seen leaving from North Light with a strong tailwind. Still present were the Ortolan, Wryneck, Red-backed Shrike, Iceland Gull and Waxwing. The wind continued to increase from the east and heavy rain set in later in the afternoon, curtailing birding for the day, but so far this morning things look promising. Trap round produced nine birds (including Redstart, 2 Sedge Warblers, Whitethroat and Blackcap), whilst several other migrants were seen around the traps. Garden Warblers in the Obs Garden have increased to at least four, whilst two Grey-headed Wagtails and an Osprey were also seen this morning. There'll be more to report later today I hope. 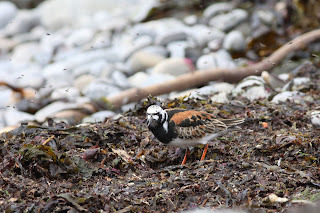 Turnstone and kelp flys in South Harbour - an excellent place for migrants when the flies are hatching.